The ledger is a basic concept in Release 12. The ledger replaces the 11i concept of a set of books. It represents an accounting representation for one or more legal entities or for a business need such as consolidation or management reporting. Companies can now clearly and efficiently model its legal entities and their accounting representations in Release 12. This seems to be a major area in getting success of the shared service center and single instance initiatives where many or all legal entities of an enterprise are accounted for in a single instance, and data, setup, and processing must be effectively secured but also possibly shared. Now, legal Entities can be mapped to entire Ledgers or if you account for more than one legal entity within a ledger, you can map a legal entity to balancing segments within a ledger. The addition in this list the ledger is defined by a 4th C: the accounting method. This 4th C allows you to assign and manage a specific accounting method for each ledger. Therefore, when a legal entity is subject to multiple reporting requirements, separate ledgers can be used to record the accounting information. Accounting Setup Manager is a new feature that allows you to set up your common financial setup components from a central location. 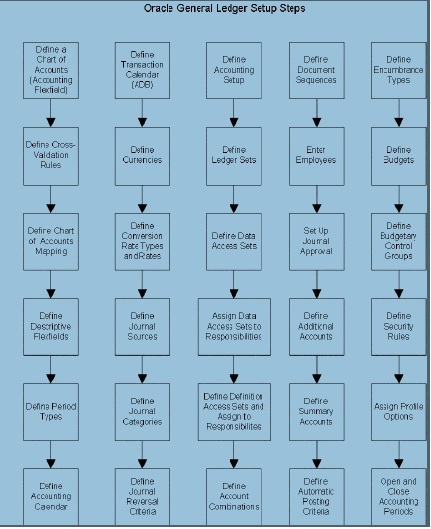 While you can set up your Oracle General Ledger application in many different ways, and defer optional set up steps until you are ready to use the corresponding functionality, we recommend you use the order suggested in the following flowchart: Some of the steps outlined in this flowchart and setup checklist are Required and some are Optional. You need to perform Optional steps only if you plan to use the related feature or complete certain business functions. General Ledger and Accounting Setup Manager. 4. Assign Legal entities to your Ledger . 5. Assign Balancing Segment Values to respective Legal entities. Navigation: General Ledger –> Setup –> Financials –> Accounting Setup Manager –> Accounting Setups. Click on Create Accounting Setup and then click on Create Legal entity. Click on Apply and then click on Next. Click on Next and then Finish. Click on Define Accounting Options and click on update. Click on Next, and assign Retained earnings Account. Click on Next, Next, and Finsh. Assign Legal entities to your Ledger. Click on Add Legal Entity. Add your Legal entity and click on Apply. Click on Add Balancing Segment Value. Assign Balancing segment values to these legal entities. Click on Apply and then click onComplete. Once you complete ledger we are getting the following Warning. Ofter click on the yes we are getting the following confirmation. Click on Return to Accounting Setups. An organization that uses Oracle subledgers, such as Oracle Cash Management, Order Management and Shipping Execution, Oracle Payables, Oracle Purchasing, Oracle Receivables, and related products. It may be a sales office, a division, or a department. Operating units are not associated with legal entities. Operating units are assigned to ledgers and a default legal context. Information is secured by operating unit for these applications using responsibilities. Each user can access, process, and report on data only for the operating units assigned to the MO: Operating Unit or MO: Security Profile profile option. The MO: Operating Unit profile option only provides access to one operating unit. The MO: Security Profile provides access to multiple operating units from a single responsibility. You can define operating units from the Define Organization window in Oracle HRMS or from Accounting Setup Manager in General Ledger. For further reference: Visit Google.com and search for “Oracle Multiple Organization Manual”. download the pdf file for detailed information on multiple ORG. Navigation: HRMS –> Work Structures –> Organization –> Description. Type your operating unit name, type ,location and organization classification.